Species diversity, along with ecological sustainability, is at the core of Snowy River Lavender’s ethic of essential oil production. We seek to commercially produce high quality lavender oils based on the premise that species diversity is important. This means we believe that there needs to exist an appreciation for the subtle interplay between the plant’s natural propensity toward diversity as the source of distinctiveness, while nevertheless maintaining the necessity of acceptable standards of essential oil chemistry for each species. To achieve this, our planting and propagation programs are organised towards growing and distilling essential oils from a range of lavender and lavandin cultivars. Seed grown lavender is also central to this ethic and is setting the foundation for producing new cultivar forms and producing our population lavender oil. In these ways we have set our scope of plants as an open and exciting field of horticultural exploration and development. Our premiere lavender cultivar, Lavandula angustifolia Bee, grows with poise and beauty in the summer sunshine on Shearer’s Slope, home field for 20,000 of these beautiful plants. The Lavandula genus is a large family of plants however not all species within this classification are viable for essential oil production. 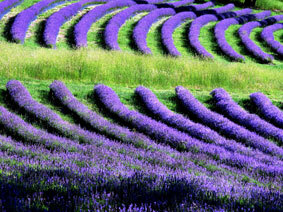 Two species of the genus account for the majority of ‘lavender oil’ produced worldwide. These are the Lavandula angustifolia species, (‘true’ lavender) and Lavandula x intermedia (lavandin), a lavender hybrid produced by the cross pollination of L. angustifolia and L. latifolia (spike lavender). 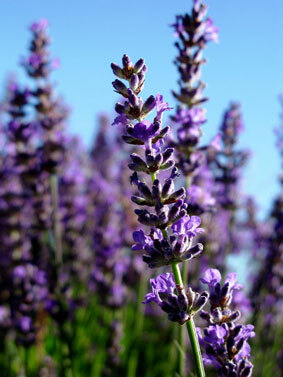 While L. angustifolia is the traditional lavender and produces the essential oil from which lavender’s high demand is derived, Lavandin because of its size and oil yield is the plant best suited to industrialised farming and for commercial reasons has come to dominate world production. Lavenders of the angustifolia species can be propagated both as cultivars, by means of vegetative cutting, and by seed, as population lavender. Lavandins, being a hybrid species, are infertile and can only be reproduced as cultivars. Although the spikes are not always as long as Lavandula angustifolia Bee’s, the open lacy flower spike is typical of most Lavender cultivars. Majesse Top Paddock 2011: Lavandula x intermedia Margaret, displays the statuesque floral abundance typical of most Lavandin cultivars. Majesse Valley 2011: despite the dense flowering of Lavandula angustifolia species, they never reach the same floral abundance as a Lavandin. Both lavenders and lavandins, as individual plant categories, are genetically varied. However, in general Lavender spikes tend to have an open & lacy structure, an appearance caused by the wider spacing between the whorls of calyxes making up the spike. Lavandin spikes generally have a more compact & conical structure with the whorls of calyxes closely fitted to each other. Lavandin’s, also have the feature of lateral bracting on the spike stem, this feature is not present on Lavenders. Essential oil yield is an important difference between Lavenders and Lavandins. 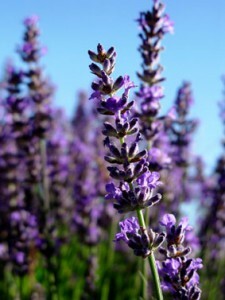 Lavandins are larger plants, 80cm-1m round in full flower, as opposed to the 50-60 cm of lavenders. This simple fact means there are more flowers per lavandin bush. In production terms, it takes around 100 lavandin bushes to 400 lavenders, to fill our still which takes approximately 100kg of flower. Essential oil production per Lavandin distillation is 1.5 - 3 litres, which works out at approximately 15-30ml per lavandin bush. 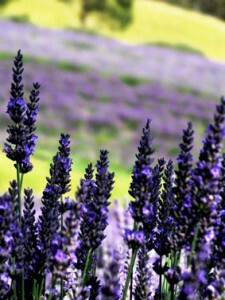 Lavender produces between 750mL and 1.4 litres per distillation working out at around 1.5 -3.5 mL per bush. Taking this difference in productivity into account the economics between the two species is obvious and why Lavandins are more often farmed than Lavenders. Snowy River Lavender has kept yield data since starting distillation of flower in 2003, the most relevant data has been kept since 2005 when single cultivar distillations commenced. Yields will vary according to the climatic conditions of the season, but over time a general pattern of a cultivar’s yield value emerges. Olfactory appeal or how the essential oil smells. While this is a basic and subjective test it is a test which is fundamental to what essential oil is, as an aromatic product. Verity or honesty of the essential oil the plant produces is important. The plants we have chosen must be able to produce a desirable oil from the still we do not homogenize our oils as one generic to the species (i.e. Lavender Oil), but, label our oil as specific to the source cultivar or plant variety. The phyto-chemistry of each cultivar’s essential oil. Achieved through gas chromatography and mass spectrometry (GC/MS), phyto-chemical profiles show the constituency and balance of an essential oil’s chemistry. Since starting single cultivar distillations in 2005 we have had our oils GC/MS tested and in this way we have created a data base for each variety we grow. 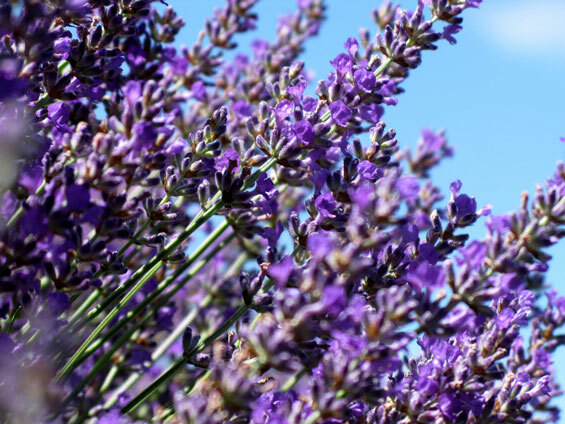 We use both Pharmacopeia (BP/EP) and Commercial (ISO) Standards as comparative tools in assessing individual variety’s relationship to an average lavender chemistry. However from this basis we also take into account character compounds and the distinctive balances of chemistry that an individual plant variety may display as a variation from these Standards. From our initial plantings and annual quality and yield testing five Lavender cultivars (Lavandula angustifolia) were chosen as the BASICS OF LAVENDER PROPAGATION core of our boutique lavender essential oil production. This section links to each of our lavender cultivar profiles. From our initial plantings and annual quality and yield testing five Lavandin cultivars (Lavandula x intermedia) were chosen as the core of our boutique lavandin essential oil production. This section links to each of our lavandin cultivar profiles. 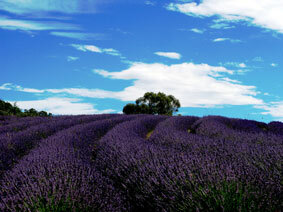 A bountiful event in 2005 initiated two new plant development programs at Snowy River Lavender. It was noticed that numerous self seeded lavenders were growing between the rows of our established lavender. After many hours of walking up and down rows we collected in excess of 3500 plants and each year since we collect more. We named these plants ‘Sponnees’ in celebration of their willingness to spontaneously grow on our farm. The Sponnee’s have been planted in patches and are now distilled as a form of population lavender. These plants have also formed the basis for our development of new cultivars to feedback into the farms boutique cultivar collection. Farming is not only about good times it is also about rolling with the punches and making the most of what ‘nature’ offers. The variability of climate is a major determinant of every harvest.